: Permanents you control gain indestructible until end of turn. 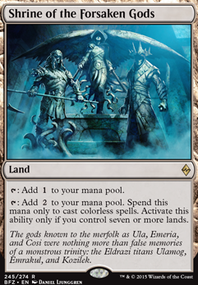 , Exile Soul of New Phyrexia from your graveyard: Permanents you control gain indestructible until end of turn. Blue is the second-best flicker color, and you're hard-pressed to find something better in Commander than Deadeye Navigator and Parallax Tide for flickering permanents out (Which is important if you're planning on playing Boardwipes that double as LD). 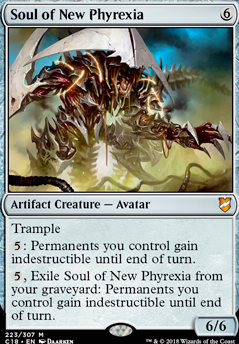 As for Indestructible, Soul of New Phyrexia is probably the best you'll get asides That Which Was Taken . I am looking for sources of indestructible that can be played in UR. 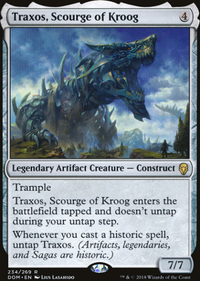 I already know of Soul of New Phyrexia but I wonder if here's more. Maybe also a way to flicker my permanents so my own Apocalypse like effects won't destroy them. Vlasiax : Not a bad idea, but I don't own a Mana Crypt at the moment. That will have to be a long-term goal. Played this deck a few times yesterday and had some trouble dealing with "Indestructible" creatures (specifically, Soul of New Phyrexia and Spearbreaker Behemoth ). 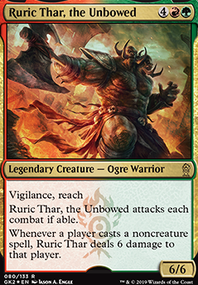 Thinking about adding Bonds of Mortality and maybe Hour of Devastation and/or Dismember . Any other ideas? Also thinking about cutting down some of the more expensive dragons for cheaper ones (as painful as that will be). Going to try to include Damnation as well. You are putting upon yourself a very dangerous restriction, so u need A LOT OF card advantage.